Southwest Airlines is completely retrofitting its planes in an effort to reduce costs and "protect the environment." Sounds great, except that the redesigned seats will take away some of the precious few comforts you had left in the air. The new Evolve cabin interiors will save the company $10 million dollars a year, and the only cost to you is an inch here and there. Your legroom will decrease from 32 to 31 inches, and the pitch of the recline will decrease from 3 to 2 inches. 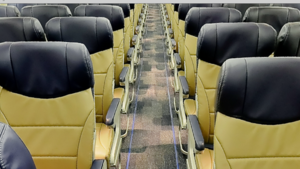 The company is also outfitting its seats with thinner cushions cloaked in a fancy-sounding pleather.